When people ask me “what is reiki?” I know I should have a quick elevator speech for them, but reiki is so much more than 30-60 second pitch. I have seen this Japanese relaxation technique facilitate deep healing in people’s lives so trying to squeeze all of that into a short pitch is a challenge. What I often tell people is that there are over 200 different “types” of reiki. I also tell them about the many benefits. Reiki can help relieve pain and aid in any recovery process. Reiki can be a catalyst for spiritual development. Reiki is great for stress reduction and relaxation. Reiki sessions can facilitate feelings of peace and harmony. When people ask what kind of pain relief can reiki provide, I tell them a few of the many possibilities. Reiki helps to relieve pain from arthritis, migraine, and sciatica. Reiki treatments also help with symptoms of asthma, chronic fatigue, insomnia, and menopausal symptoms. Reiki has so many benefits that I was interested in learning more about different types. Yesterday I took the first half of an Animal Reiki I class which is based from another lineage (or learning branch of the reiki heritage) than the kind I learned originally. I am already a reiki master, but I thought it would be interesting to learn more about sharing reiki with animals specifically and to learn about another lineage. I love that this school of thought emphases the Reiki Precepts. The word “precepts” means “rules of conduct” and I believe they are excellent ideals to live by. Some lineage have slightly different translations, but they are all very similar. Basically the Reiki precepts talk about releasing anger and worry, being humble and grateful, being true to yourself and showing compassion to yourself and others. 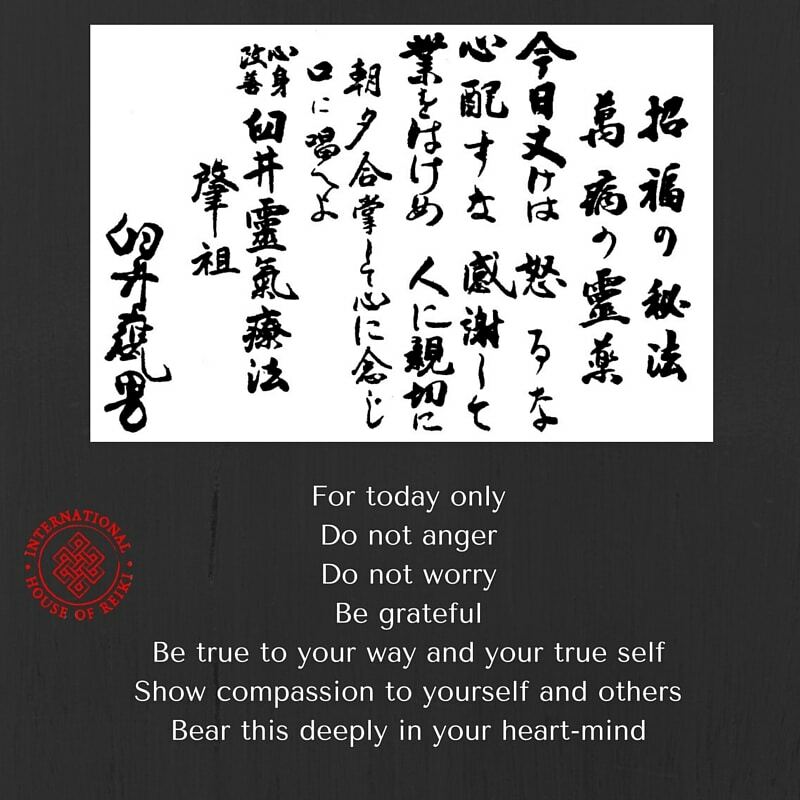 Below in the picture from International House of Reiki, the precepts are translated and above the translation are the original kanji symbols. During this Animal Reiki class, we took the opportunity to chant the reiki precepts in Japanese. The result was beautiful and I wish I had recorded it. Below is a video of the same chant performed by Frans Stiene from International House of Reiki. His pace is a little too fast for it to feel as meditative as the chant we did in class yesterday, but it is still great to listen to for pronunciation. Previous Post Take Charge of Your Life! Next Post Can You Meditate Too Much?